This X-Ray project is a spin-off of the Cosmic Ray Detector Project to find a suitable radioactive source for testing. 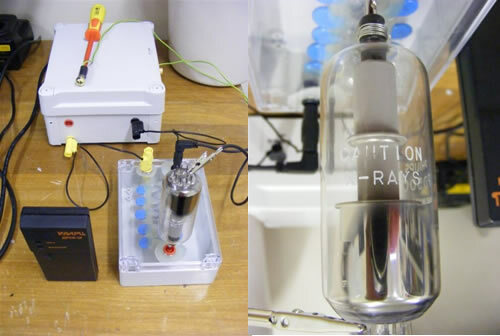 So with a little googling I've found its quite simple to produce x-rays if you have a high voltage DC source in excess of 45Kv and a suitable vacuum tube. X-Rays and High Voltages are very dangerous always be careful and use a Geiger Counter. So it is quite lucky I've held onto those TV rectifiers and beam triodes that I had in the shed. My first tests where very limited using a 50hz hv supply and half wave voltage multiplier. This is because you must use a higher frequency ac supply to archive any level of current, when using low value capacitors. I achieved ~55kv with a ten stage multiplier with a ~5kv 2khz ac supply using affordable 10nf 6kv capacitors. Achieving an increase in the rate of clicks on a Geiger Counter above normal background levels which has been just enough to test the cosmic ray detector elements.